Three adjustable shelves support 350 lbs. each. Four casters for mobility. Two locking casters. Total unit capacity is 500 lbs. when used with casters. Assembles in minutes without tools. Strong welded wire construction. Double-sided access. 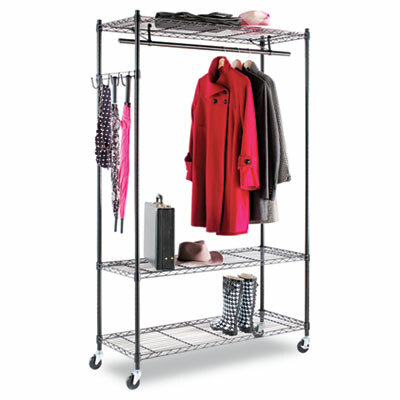 Rack includes four-foot hanging rod for garments, and four support hooks for umbrellas, bags, and other items. Three shelves support 350 lbs. each. Four casters, two locking. Total unit capacity is 500 lbs. when used with casters. Open design allows air circulation and prevents dust buildup. Powder coated black finish. Hangers not included.